Check out all our Season Membership options. 18 Holes with cart $30. 9 Holes with cart $20. Nestled in the heart of Vernon County, this spectacular public course offers golfers a challenge with 18 holes and over 6,300 yards of scenic fairways and greens. The new nine, built in 1996, features several unforgettable holes including number 11, also known as the signature hole. It has an elevated tee box on the lip of a 90-foot drop off—a very challenging first shot indeed. To get to the new nine, you cross through a tunnel under Highway 14. Awaiting you there are two large ponds and a beautiful waterfall, which add not only to the challenge but also to the picturesque setting. 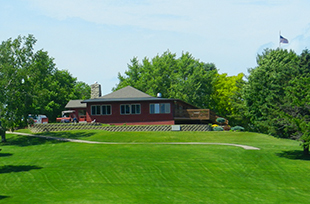 The original course has its own unique characteristics as well, including a clubhouse overlooking a countryside of woods and hills which can be viewed from many locations throughout the course. The clubhouse features a pro shop, restaurant, bar and carry out services as well as golf cart and club rental. 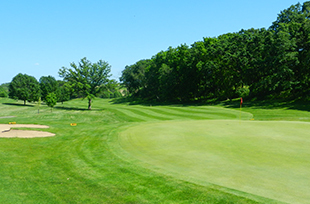 If you’d like to brush up on your game before trying out the course, Viroqua Hills offers a driving range and two practice putting greens. The course is waiting... GET YOUR GEAR & GET OUT HERE!